Cpl. 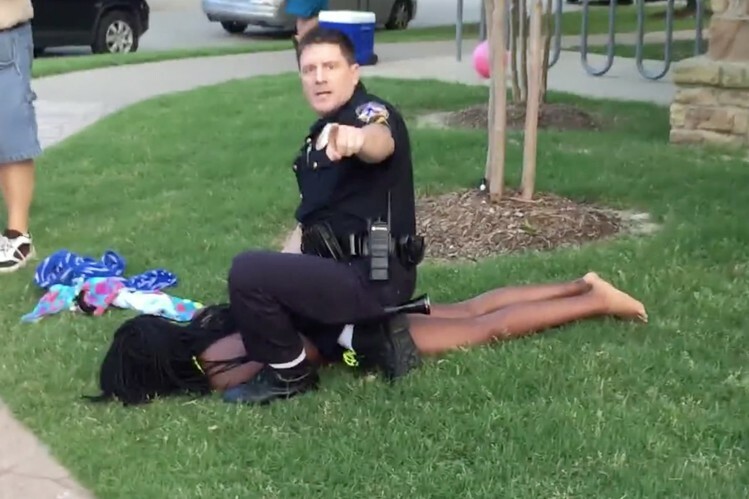 David Eric Casebolt restraining a 15-year-old girl outside a community pool in McKinney, Texas. Nearly 60% of all Americans own a smartphone. That means that almost two out of every three people you see are a potential journalist. In fact, a Pew Research Center report suggests that around 12% of all news stories come from average citizens who witness or record newsworthy events. Often, such newsworthy events include law enforcement. So when a citizen feels the need or desire to start recording, one may have to ask himself is it lawful to videotape the police? What’s more, will this video evidence be admissible in court? The Eleventh Circuit Court’s ruling seems to be clear that videotaping police is protected by the First Amendment, yet the Third Circuit Court’s ruling suggests that recording police is not protected at all. So which is it? And to make the question even more difficult, many courts over the years have echoed the sentiment that the right to record police is not “clearly established”. In the state of California, the law is clear: one may record police conducting their duties in public provided that they (the police) are not obstructed or impeded from performing their duties. That being the case, any video created or obtained that was done so in this manner would be admissible in court. This, then, begs the question, would recordings made surreptitiously be admissible? In many cases, such a recording may be considered wiretapping (particularly if the recording includes audio), thus leaving the recorder susceptible to prosecution. None the less, the recording may be admissible, but at a price of potential civil or criminal prosecution against the recorder!